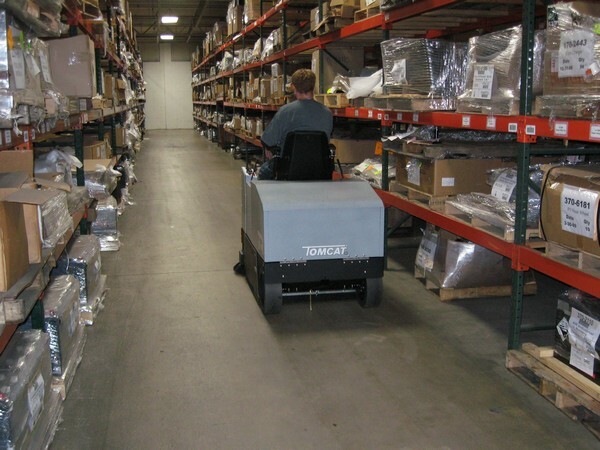 Warehousing companies often invest in a scrubber-sweeper from Tomcat, to keep inventory items free of dust while in storage or transit. We have seen a marked increase in the number of customers who are using the Walk Behind Sweeper and Compact Rider Sweeper (TR) to clean the inside of trailers while at the loading docks. While scrubbing is still the most popular answer for cleaning cold storage floors, we suggest customers consider a sweeper as well. In comparison to a scrubber, a sweeper may offer the customer satisfactory frequent cleaning results, and without the additional cost and complexity of scrubbing. Cold storage warehousing poses a unique challenge for scrubbers, as the clean solution used must be able to accommodate the temperatures without freezing - For which we have our "Freezer Package" option. In only a matter of minutes, an entire trailer can be swept clean of debris and dust, allowing delivery of product to maintain the same standards that were first established inside the warehouse.